The plugin can be installed via the plugins / add new menu in wordpress. 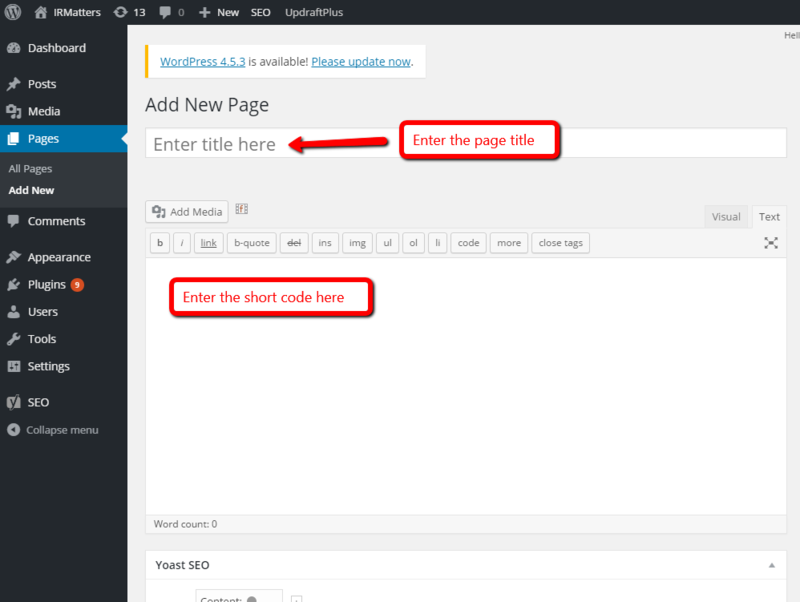 upload the provided zip file when prompted in wordpress. Once installed you can access the plugin via Settings / IRM Newsroom in wordpress back end. Add the sitekey provided to you which should be something like http and then irm5.live.irmau.com press save changes to update the setting. If you have entered the site key properly it should show a list of your pages below. 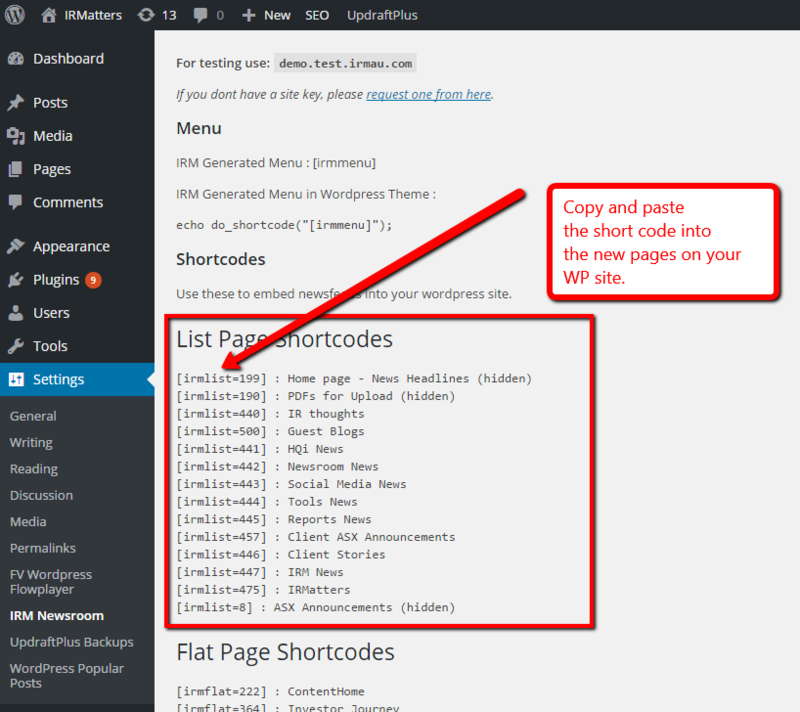 Under the menu List Page Shortcodes and Flat Page Shortcodes you will find your pages from the IRM version of your site. Copy and past the short codes into the new relevant pages that you have created. This will be dependant on the type of announcements you'll have, and how many you'd like to feed through from the ASX. First, login to the URL provided for the Short Key, with an additional ' /IRM ' at the end of it. 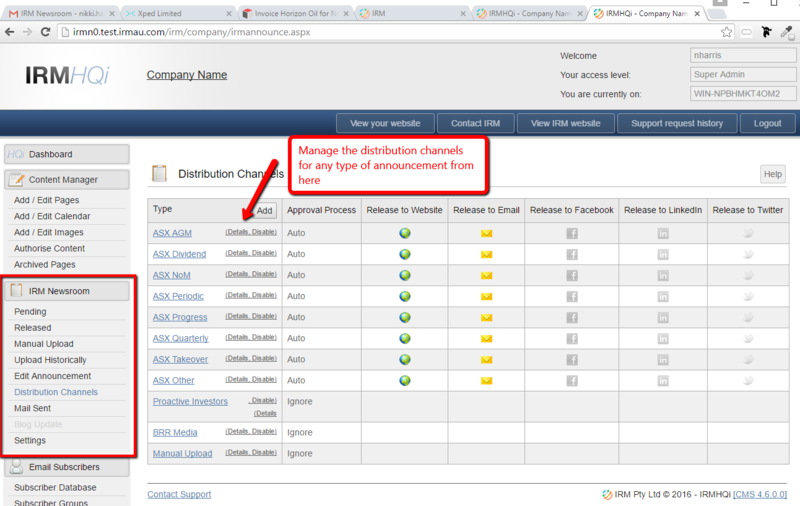 Login using the details provided by your project / account manager. The dashboard screen will appear, all the settings you'll need are under 'Newsroom'. If your theme supports it you can also import the menu from your IRM site into wordpress, it will however link back to your IRM site rather than the wordpress site so this may be useful only if you are replicating the irm theme on your wordpress blog. The plugin also comes with a feature that can connect your wordpress blog to your irm site, and when you publish a new blog post or update an existing one it can be published on the irm site as well.